One useful tip: download the portable version of Rufus so you don’t have to install it on your PC. You can also keep it with your downloaded Linux ISO files in case you want to switch to a different Linux distro. 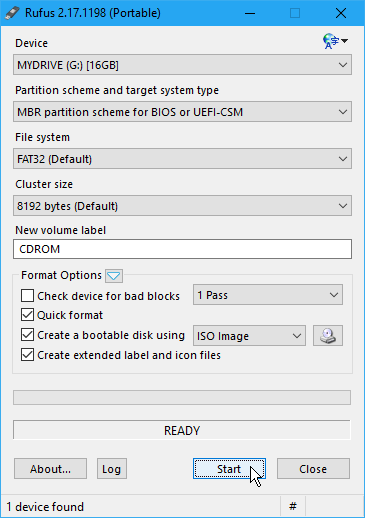 Rufus is very fast at creating a bootable USB drive, enabling you to easily switch between different distros. 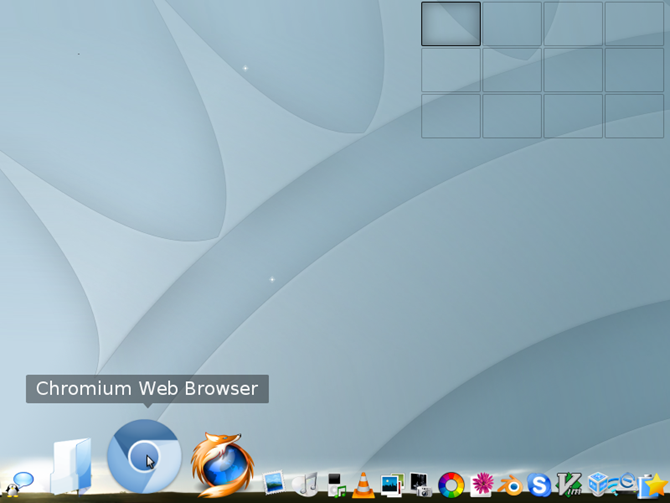 ArchBang is based on Arch Linux and inspired by CrunchBang, which was another lightweight Linux distro. It’s is essentially Arch Linux made easier. It includes the power and flexibility of Arch Linux without the complex setup and installation. You can use ArchBang as a fully featured desktop operating system or as a portable, live OS. It’s fast, stable, and always up to date. Damn Small Linux, or DSL, was designed to run graphical applications on older PC hardware. Think machines with early Pentium processors (such as the 486 series) and very little memory. It’s light enough to run with as little as 16MB of memory, and it can also be run fully in memory with as little as 128MB. DSL started as an experiment to see how much software could fit into 50MB, but it eventually evolved into a full-fledged Linux distribution. It can be installed onto storage media with small capacities, like USB flash drives and memory cards, and onto a CD. You can also do a traditional installation onto a hard drive as a Debian desktop OS. DSL includes a nearly complete desktop, and a very small core of command line tools. The applications available in DSL have been chosen for the best balance of functionality, size, and speed. 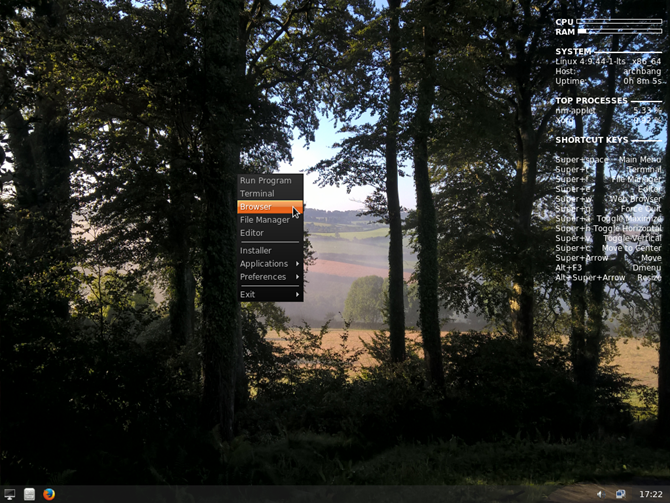 Elive is a lightweight Linux distro with its own custom desktop environment. It’s based on Debian and comes pre-installed with all the apps you need, including games. If you’ve used a Mac before, you should be comfortable using Elive. It has a Mac-like dock and virtual desktops like Mac’s Spaces. The desktop in Elive is a customized version of Enlightenment which offers a light and beautiful experience. It works well, even on very old PCs. The minimum requirements for Elive are a CPU speed of 300MHz, 700MB of disk space, and 128MB of memory. 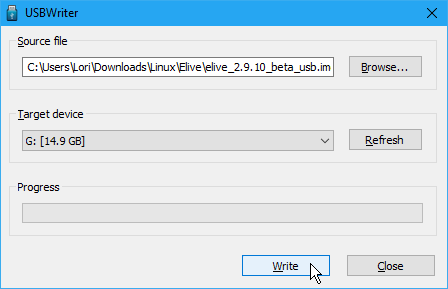 When downloading Elive, select the IMG file. You’ll also need to download USBWriter to create a bootable USB flash drive or live CD. Porteus is a lightweight, but complete, Linux distro that is optimized to run from a USB flash drive. Don’t have one? Don’t worry! Porteus will also work on an SD card, CD, DVD, hard drive, or other bootable storage media. It’s small and insanely fast, allowing you to boot and get online while other operating systems are still thinking about booting. Porteus runs on any Intel, AMD, or VIA x86/64 processor, requiring only 512MB of disk space and 256MB of memory. No hard disk is required, as it can run from removable storage media. If you use Porteus on a removable storage media device, you can take advantage of its “Persistent” mode, which saves data directly on the storage device. It is available in both 32-bit (perfect for older PCs) and 64-bit. A kiosk edition is also available, which is a minimal system that is locked down for use by the public on web terminals. 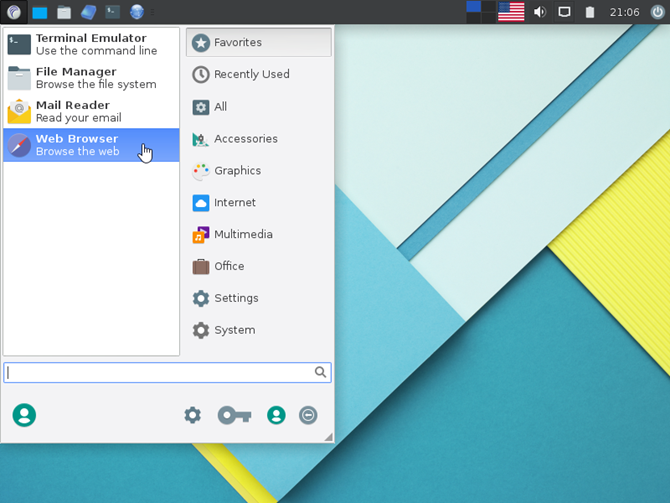 You can choose to download the Cinnamon, KDE, MATE, or Xfce version of Porteus. Puppy Linux is a very lightweight Linux distro that should only be installed on and run from a USB flash drive, SD card, CD, DVD, hard drive, or other bootable storage media. The minimum requirements include a 233MHz processor, 512MB free hard drive space (to create an optional save file), and 128MB of memory. The optional save file allows you to save your data directly on the removable media and run the system, with your saved data, on any computer. There are two official variations you can download of Puppy Linux, Slackware-based and Ubuntu Tahr-based. 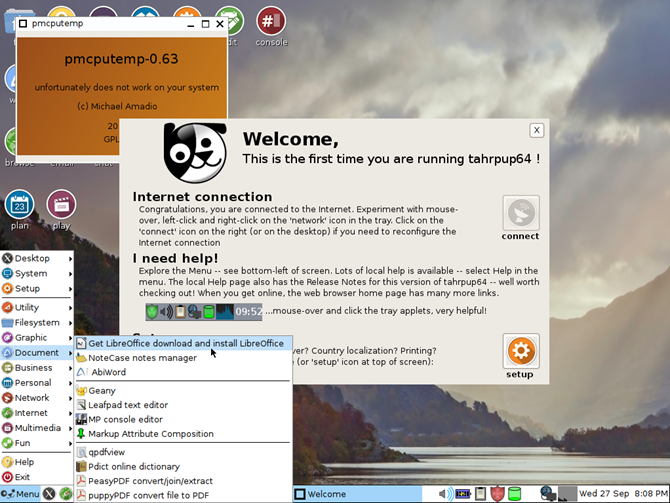 Other unofficial versions, built by Puppy Linux enthusiasts, are available. SliTaz, or Simple Light Incredible Temporary Autonomous Zone, is a lightweight, fully-featured, working graphical Linux distro that’s small, fast, stable, and easy to use. The minimum hardware requirements include an i486 or x86 Intel-compatible processor, 80MB of disk space, and 192MB of memory (or as low as 16MB, depending on which version of SliTaz you use). While SliTaz is running, you can use the removable media for other tasks or even eject it. The system runs in memory. SliTaz also has a “persistent” feature that allows you to store your data and personal settings directly on the removable media. When the system is running you can eject the LiveCD and use your CD drive for other tasks. The Live system provides a fully-featured, working graphical distro and lets you keep your data and personal settings on persistent media. WattOS is a lightweight, fully featured Linux distro based on Ubuntu that you can run from a USB flash drive, CD, or other removable media, run in kiosk mode, or install to a hard drive. 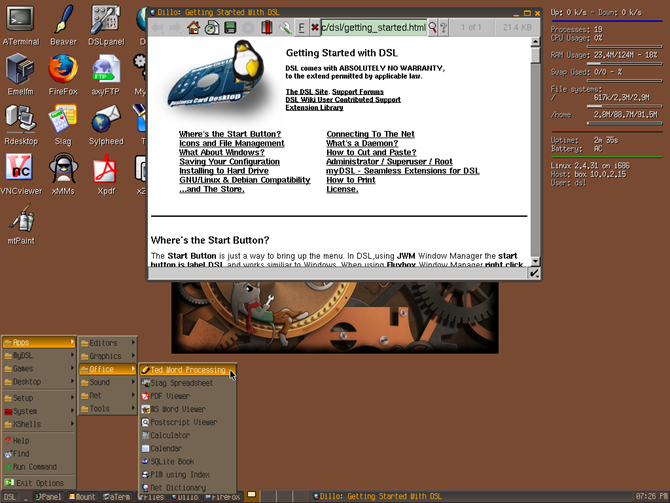 The minimum hardware requirements include any Intel or AMD processor, 700MB of disk space, and 192MB of memory for the Microwatt edition of wattOS (more if you use the LXDE edition). The Microwatt edition is extremely lightweight and based on the i3 tiling window manager. It offers low resource requirements and simplicity. The LXDE edition is a lightweight, fully featured, and customizable desktop operating system that is great for beginners. Note: When asked for a login in wattOS, enter “guest” as the user name and no password. Bring your old PC or removable media back to life with any of these super small Linux distros. This could be a great way to provide a simple computer for a relative who doesn’t need all the bloat of a more complex operating system. 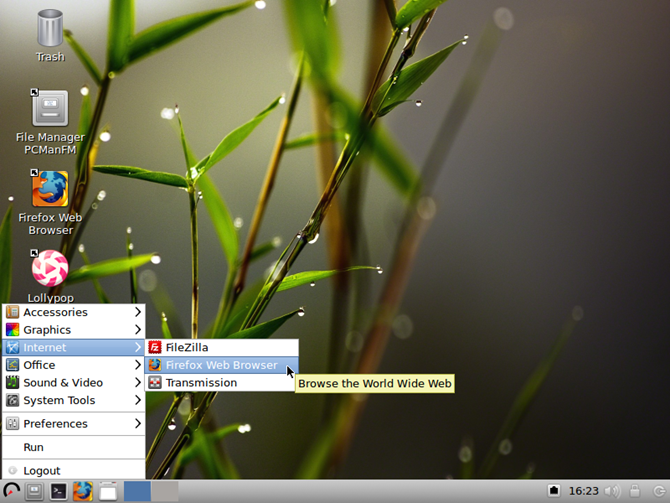 These Linux distros will allow them to surf the web, watch and listen to media, check email, and create simple documents. What do you think of these Linux distros? Have you found any other tiny Linux distros you like? Share your thoughts and experiences in the comments below. If you’re preparing a machine for someone new to Linux, you might also provide them with a link to our Linux FAQ. Explore more about: Linux Distro, USB Drive. To be a consummate roulette player you need to understand well on the way to extract winnings at one time understand how to minimize losses. or 2 times, sometimes even in rows. Who would believe that even slots can be played using the internet.